Mueller’s team describes Papadopoulos as a “proactive cooperator.” That’s a big deal. Here’s why: Mueller purposely sealed the indictment and kept the arrest secret so that others wouldn’t know Papadopoulos was working with his team — because the probe might be using Papadopoulos to obtain even more information on possible Trump-Russia collusion. 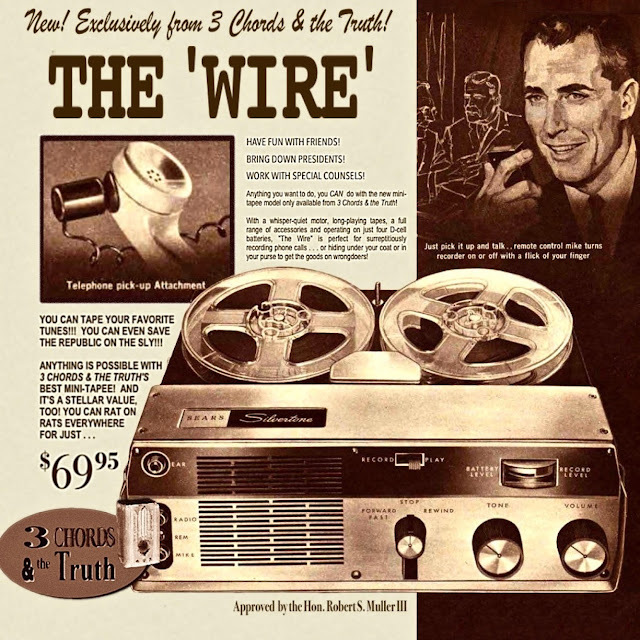 The Toronto Star’s Daniel Dale reports that when prosecutors consider someone to be a “proactive cooperator,” it could signal that that person was wearing a wire. And if that’s true, that means Papadopoulos might’ve talked to Trump campaign officials with a wire on. That’s still speculative, of course, but it could pose a serious problem for Trump if officials with secrets to keep unknowingly divulged information to a wired-up Papadopoulos. Labels: 3 Chords & the Truth, Big Show, corruption, crime, Donald Trump, humor, media, politics, Russia, special prosecutor, spies, stupid criminals, tape recorder, treason, Washington D.C.